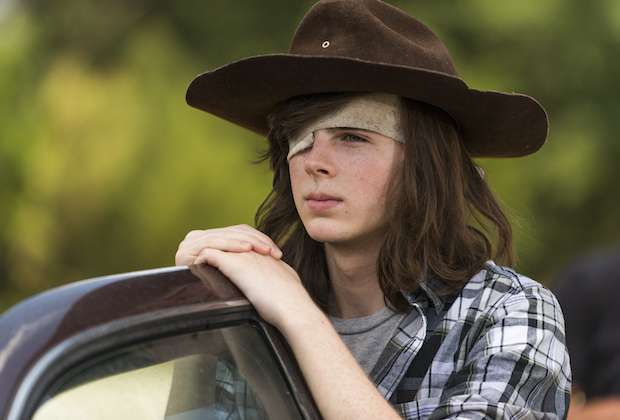 The Walking Dead season 8 episode 8 (midseason finale) review: Was Carl bit by a walker? Tonight is the midseason finale of The Walking Dead season 8 and then we enter a long hiatus until the show returns. When we last saw our group, Rick had just arrived at Negan’s compound ready to execute the next part of his plan. Unfortunately Daryl and Tara had already gotten there first and drove a truck into the side to the building releasing all of the walkers inside. We still don’t exactly understand why Daryl and Tara couldn’t have waited until Rick was ready to execute the plan, because now all hell has broken loose. The compound is filled with walkers, Saviors are scattering and who knows where Negan is. Don’t go blaming just Tara and Daryl though, it’s actually Eugene that helped everyone escape. Now everything is a giant question mark for Rick’s side with no way to know what’s happening – he’s lost his only advantage since the Saviors have the numbers. As soon as Jadis sees that the Saviors are gone and Rick’s plan has fallen apart her group takes off (surprise, surprise) and Carol drives up to get Rick out of there. After Daryl’s little plan went sideways, Negan has shown up in Alexandria. He’s giving them three minutes to come up with their apologies and once they are done he’s going to kill Rick in front of everyone and promises that things will go back to what they were. Carl quickly takes charge of the situation and gets everyone out of Alexandria giving up the town but not their lives. He feels that if they can survive the night, then they can regroup and figure out where to go and what to do. After everyone gets ready to leave, Carl goes to Negan and offers up his life – saying that instead of burning the town to the ground and killing everyone, he will die so that they can live. It’s enough of a distraction that everyone can leave and Carl can get away too (and he burns the town to the ground himself). When Rick heads back to his house and finds a bat swinging Negan there, we finally get to see the one on one fight we’ve all been waiting for! Eventually he manages to make it to the sewers with the rest of his group, but everyone’s scared and tired of fighting. The Saviors have gone to the Kingdom and is turning all the people there into slaves – they will repair the sanctuary, get them supplies and in return they will get to live for the sole purpose of producing for Negan. They also want Ezekiel, but he has other plans and that includes creating a distraction to get his people out to safety. Once they are all out safely, Ezekiel turns himself over to the Saviors. Maggie and Jesus are on the road, but are stopped by Simon and the Saviors. Simon tells Maggie that the Hilltop is being spared because Negan wants them to keep producing. After agreeing to what Simon wants, she heads back to the Hilltop and gets everyone to start fortifying the walls. She then kills one of the Saviors, puts him in a coffin and has him sent back to Negan with a note saying that they have 38 more Saviors so they better stand down. Rick used to be a man with hope for a better future, but time has hardened him and this war has but one focus for him – killing Negan. Carl on the other hand was a child when this whole thing started and we’ve seen him grow from that child into a teenager and now into a young man. He can kill when he needs to, but he still feels that there has to be a better future then killing everyone. He’s looking past killing Negan and trying to figure out the long game – everyone living together in some sort of harmony. We already saw what Carl did with Siddiq (giving him food, water, shelter and hope) and we have to say that while Carl may be young, he probably has a better understanding of this world then anyone since this is pretty much the only world he’s ever really known. He’s the type of leader this group needs, someone who has hope, but doesn’t aggrandize it (like Ezekiel) and will make the hard calls when he has too (much like Maggie). As much as fans often like to complain about Carl, he’s someone that we have grown to love over the years so seeing that Carl had been bit by a walker at the end of the episode was especially heartbreaking for us. Tonight’s episode brought us back to the season 7 premiere where we felt dread and hopelessness. This is a world where there is very little hope to begin with, and since losing Glenn (he and Maggie were our beacon of hope throughout this show) it’s felt like one big hopeless pool for a season and a half with the season 7 premiere being the most hopeless we’ve felt through out the entire series… that is until tonight’s episode. We thought there would be more deaths tonight since this show likes to kill people before a hiatus, but we just lost a bunch of red shirts tonight. This was an incredibly depressing episode and hasn’t really left us all that excited for the show to come back. Time to go and drown our sorrows in a giant tin of chocolate pudding – Carl Grimes style. What did you think of The Walking Dead season 8 mid-season finale and are you excited for the show to come back? Leave us a comment in the box below with your thoughts. If you want to know more about what’s coming up on The Walking Dead when it returns then head on over to the link here for some scoop. I’m sorry, but I didn’t see Carl Get bitten. Somebody put a big spoiler on another board about Carl, but I won’t ruin it for everyone else. I don’t see anything being left of Alexandria and possibly the Kingdom. I don’t think Eugene had anything to do with the Saviors getting out. They simply trapped enough walkers in the lower levels so they were finally able to escape. I would like to see the situation with the garbage people resolved by the end of the season. They are just annoying already. I also want to see the main group back on the road again by the second episode of season 9, if there is one.